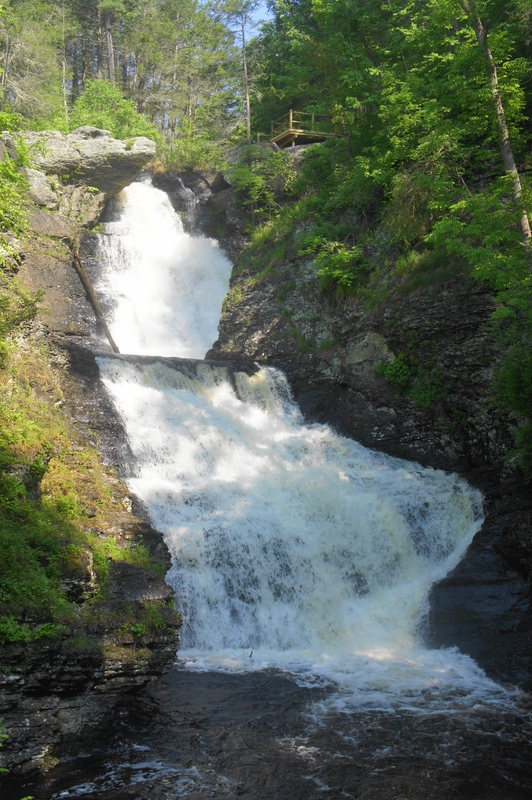 The 150-foot Raymondskill Falls, when at full strength, is one of the most spectacular waterfalls in the Mid-Atlantic and the tallest in the state of Pennsylvania. Nestled in a shaded valley in Delaware Water Gap National Recreation Area, the three-tiered falls are reached by way of a short but steep trail. 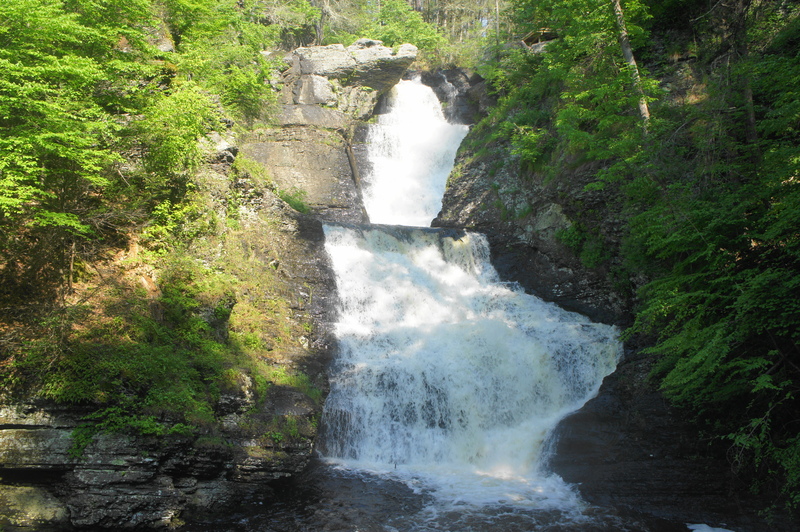 While Raymondskill is just one of several waterfalls in the area, it lacks both the crowds and atrocious entrance fee of nearby Bushkill Falls, and as of summer 2018, was one of the few waterfalls in Delaware Water Gap NRA that was open to visitors following storm damage earlier in the year that closed many of the trails. The loop trail begins at a parking area off Raymondskill Road in the northern section of Delaware Water Gap National Recreation Area, about four miles south of Milford, Pennsylvania. (Note: There are actually two parking lots that provide access to the trail; the marked lot that is farthest to the west, however, is the best starting point.) There is a restroom and trail kiosk at the trailhead, and the main path takes off to the right. The Raymondskill Falls Trail begins with a gradual descent, eventually growing steeper as it drops to a wooden platform with two benches after about 50 yards. From here the path drops further as the roar of the falls drowns out the wind and sound of chirping birds. At about 100 yards, follow the spur trail to the right, which leads to a wooden platform overlooking the falls. While upper falls is little more than a 2-foot drop, you can also peer over the precipice of the much taller middle falls. Work your way back up the spur path to the main trail and bear right as the path hugs the edge of a stony bluff with a small cave on the left. 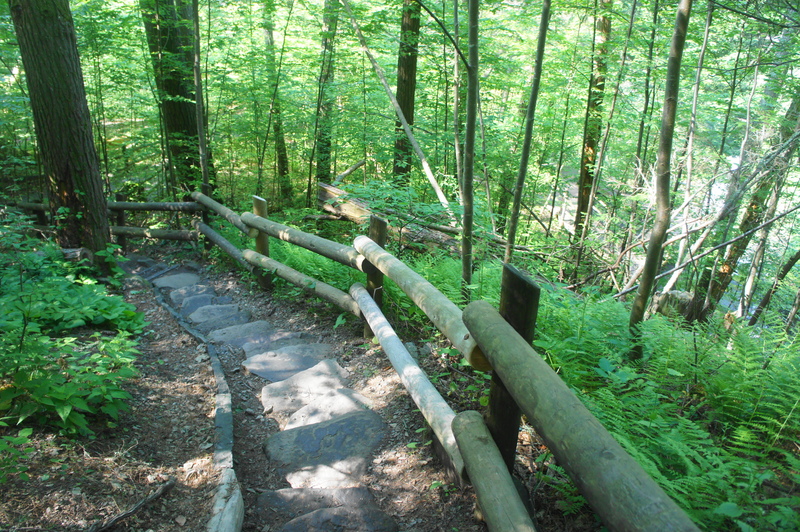 The trail descends a set of steep, slippery steps before reaching a second spur at about 0.15 miles. Take a right here, following the path to the second viewing platform, this one situated perfectly at the base of middle falls. 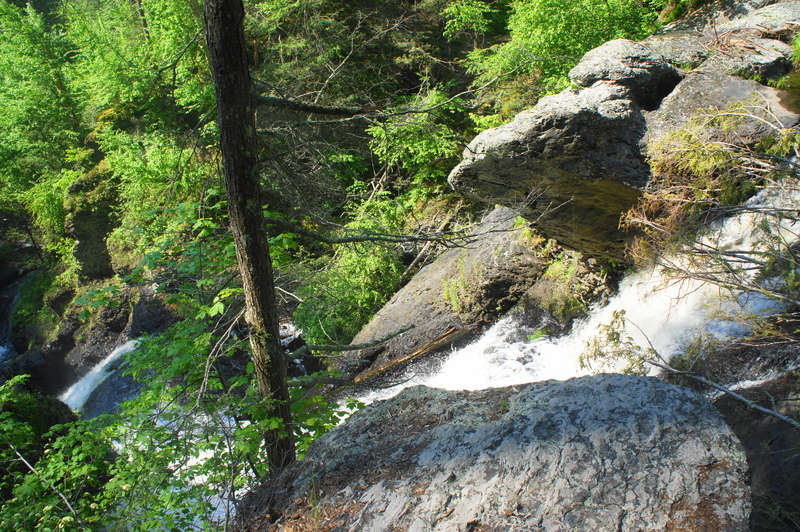 The view of the roaring falls, especially in spring, is spectacular. Here Raymondskill Creek drops over a two-tiered terrace, slicing through beds of sandstone and interbedded shale and siltstone. The observation platform also sits at the top of lower falls, which tumbles around 25-30 feet and is met by a perhaps seasonal fall—known as Bridal Veil Falls—which drops out of a sea of vegetation along the wall opposite the platform. The moist canyon walls are coated with green lichen, giving the falls an additional, colorful flair. From the viewing platform, head back up the wooden stairs to the main trail, then continue to follow it right as it wraps around to the east and briefly levels off. 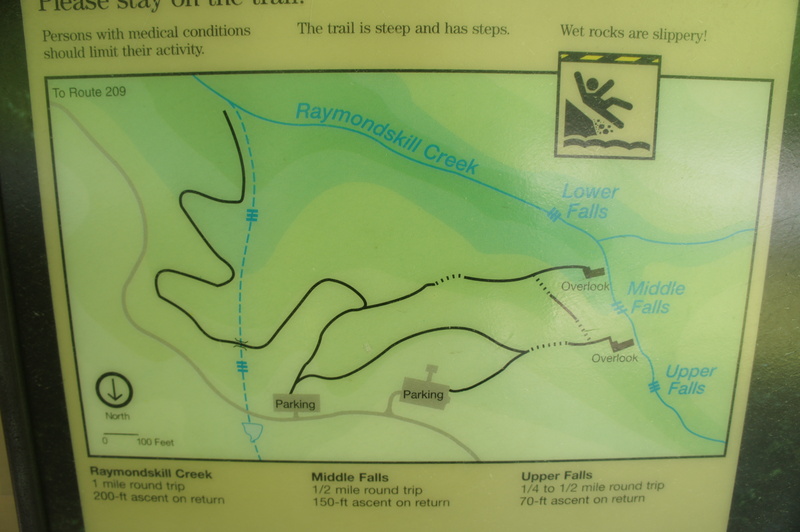 At about 2/10 mile, the path ascends an uphill, gravel path and reaches a fork with the Raymondskill Creek Trail, a dead-end path to provides access to the stream well downstream of the falls. Continue left as the path bears north toward the parking area. Just as the road is within sight ahead, bear a hard left at the next trail junction—the parking lot straight ahead is different from the one where you started. From here, follow the wide path as it traces west back to the original parking area and trailhead. 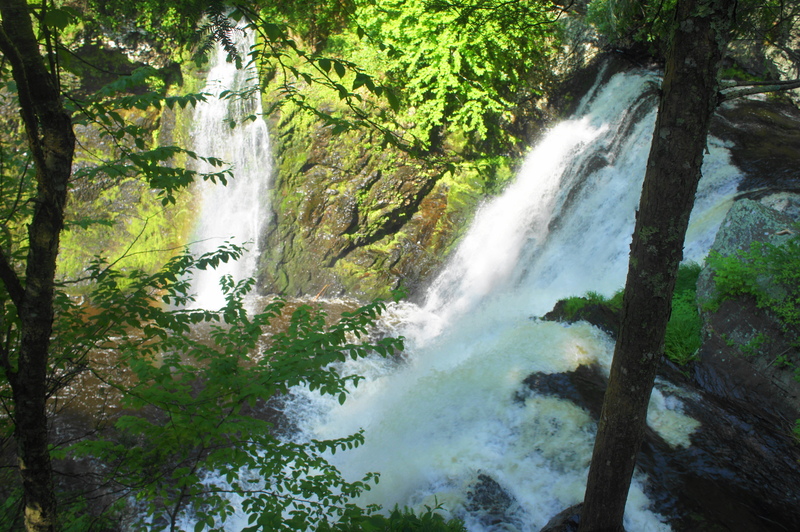 The entire hike, with some breaks to admire the awe-inspiring falls, should take around 30-45 minutes. 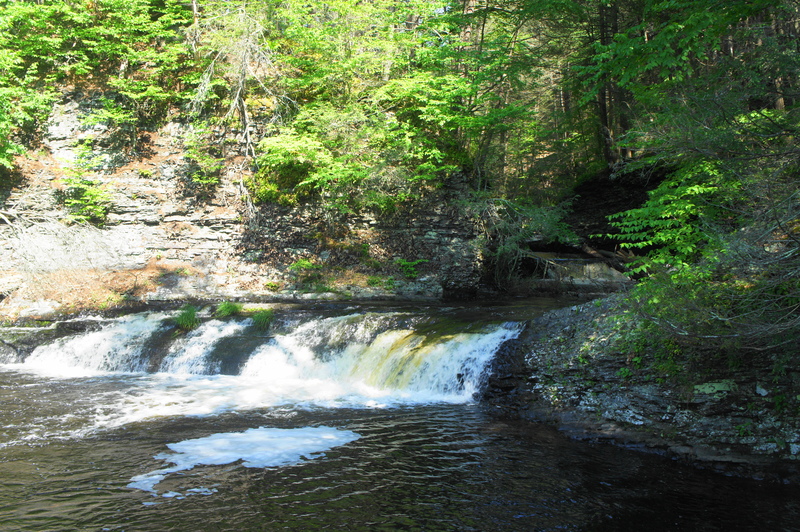 This entry was posted in Delaware Water Gap National Recreation Area, Moderate Hikes, Pennsylvania and tagged Bridal Veil Falls, Delaware Water Gap, loop hike, Pennsylvania, Raymondskill Creek, Raymondskill Falls, Raymondskill Falls Trail, waterfall. Bookmark the permalink.